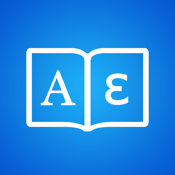 Bilingual dictionary translate words and phrases from English to Greek and Greek to English. 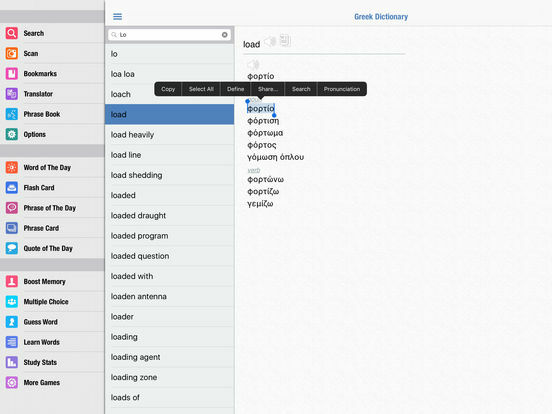 Over 89,000 English and 87,000 Greek words in an offline dictionary, with English and Greek pronunciation. Includes single player and multi-player vocabulary training games. • Apple Watch supported for quick access of saved and recent search words, phrases, translation and word of the day. Designed for students, professionals and travelers using any iOS device, including iPhone, iPad, and iPod Touch. Greek Dictionary will automatically optimize itself for both Universal displays and Retina displays to ensure text is easy to read. Users can customize the font for both English and Greek to ensure the text is readable. Definitions include Wiktionary word information, including historical uses of the word and synonyms to help students find the most appropriate word for any sentence. Users can copy and paste translations into any other app or send the translation directly by SMS text message—plus the translation can be sent to Twitter as a tweet, Facebook as a status update, or LinkedIn as a network update.